The F-051 has one of the largest imprint areas when space constraints are concerned. This model has our popular rubberized finish called "Soft-Touch". Note: The casing of this drive can be customized to match your PMS color. Inches: 2.93" x 0.78" x 0.29"
A Metal Key Chain is a great accessory for your USB flash. 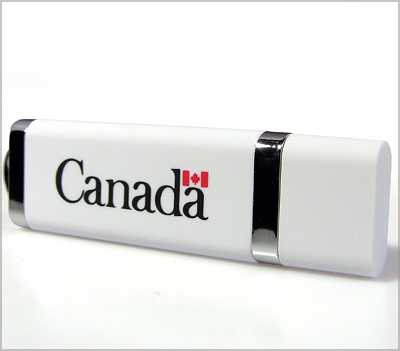 This choice increases the likelihood that your branded flash drive will be on their person at all times. Note: This key chain is FREE with each flash drive ordered. Pricing is in column. The lobster claw is a perfect accessory when you require a robust attachment with easy access. Designed such that more then one item can be attached with the lobster claw. Pricing is in column. Lanyards make a perfect accessory for USB flash drives. Our Lanyard sports a detachable clip/buckle so you don't have to remove the entire lanyard from around your neck to use the Flash Drive. NOTE: This lanyard is FREE with each flash drive purchased. Price to purchase seperately is in column. Lanyards make a perfect accessory for USB flash drives. Our Lanyard sports a detachable clip/buckle so you don't have to remove the entire lanyard from around your neck to use the Flash Drive. Ideal as a promotional tool at trade shows, conferences and events. Note: This lanyard can be printed. Pricing is in column.